We are pleased to announce that we now supply a range of Borla exhausts. You can choose between three levels of noise. The S-Type exhaust is a mid-volume exhaust for the car enthusiast, the Touring exhaust is for those who prefer the sound of an exhaust to anything else, and the ATAK exhaust delivers the highest possible street-legal volume available. Borla manufacture world-class exhausts which beat all expectations and have received multiple Best New Product awards in the industry. Every Borla system is made from the best quality materials and are designed for an accurate fit and easy installation. Borla exhausts also benefit from performance advantages, not only maintaining engine power, but in some instances also adding to it - up to 10 horsepower. Some of them also improve fuel efficiency at cruising speeds. There’s no sound better than the unleashed fury of performance exhaust system. Borla exhausts will launch your car from from restrained rumble to primal roar, with enhanced performance from an engine that breathes better than it ever has before. At Tarmac Sportz, we love driving a car that sounds as bombastic as it feels, and we firmly believe in the reputation and quality in the products of Borla Exhausts. Depending on your preferences, you can choose between exhausts that prioritise either performance or sound. If you want medium levels of noise, then go for the S-Type series, if you want something a bit louder then go for the Touring series, and if you want the loudest possible road legal noise, then go for the ATAK (Acoustically Tuned Applied Kinetics) series. All of their exhausts will enhance your engine with improved performance. Their entire range of exhausts are guaranteed to get your blood pumping and engine breathing. There are Borla exhausts for a huge number of makes; Audi, BMW, Chevrolet, Ford, Honda, Hyundai, Infiniti, Jeep, Lexus, Mazda, Mitsubishi, Nissan, Porsche, Subaru, Toyota and VW. Borla work out of a state-of-the-art factory, which continues to use the latest testing and development tech to ensure high-quality, reliable, and safe products that won’t fail you. Borla also offer a truly stunning million mile warranty - that’s how confident they are in the quality and reliability of their exhausts. They are confident that your Borla exhaust will go for at least one million miles (far beyond the life of the car) before it could possible break. We like their cocksure attitude. Borla’s exhausts are made from high-quality materials like titanium, carbon fibre and 100% pure, aircraft-quality T-304 stainless steel; they accept no cheap imitations. Stainless steel of this quality offers durability and longevity for your exhausts and it’s why Borla are so full of self-assurance when it comes to the lifespan of the exhausts they make. 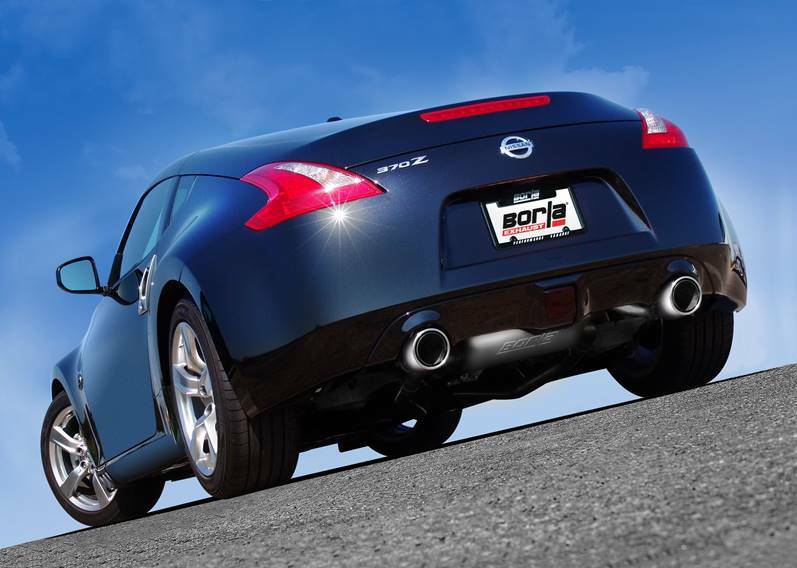 Have a look through the Tarmac Sportz catalogue of Borla exhausts, we’re sure you’ll be able to find the exhaust to fit your car and your noise and performance preferences.